Yesterday was Yom Kippur, the Jewish holiday of atonement. Growing up in rural New York I knew very little of the holiday; but fortunately many of my clients believe the student should also be the teacher and helped me to understand their culture. 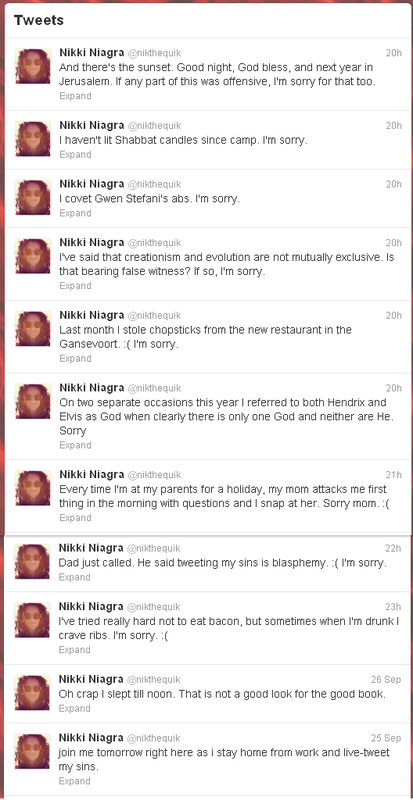 One such client, the infamous “Real” Nikki of crazy shorts and sneakers fame, felt compelled to put herself on blast. I enjoyed a good chuckle as sunset approached last night and thought you might too. Maybe you have to know her, but that just rocked my world. If it did nothing for you, fortunately the holiday is over and I don’t have to be sorry. That made me almost cry I was laughing so hard…LOVE IT!